Sensorless Vector Micro AC Drive. The compact design is ideal for small and medium horsepower applications. The M drive is designed to provide an ultra-low-noise operation, and includes several innovative technologies that reduce interference. Applications : Packing machine; dumpling machine; treadmill; temperature/humidity control fan for agriculture and aquaculture; mixer for food processing; grinding machine; drilling machine; small size hydraulic lathe; elevator; coating equipment; small size milling machine; robot arm of injection machine (clamp); wood machine (two-side woodworking planer); edge bending machine, elasticizer, etc. Warranty 1 Year for manufacturing defects only. Powder Coated used mitsubishi make PLC..
Used Micrologix PLC 1400 ..
FeaturesSub-fractional low cost AC Drive. Specifically designed for low horsepower applications with..
FeaturesSub-fractional low cost AC Drive. 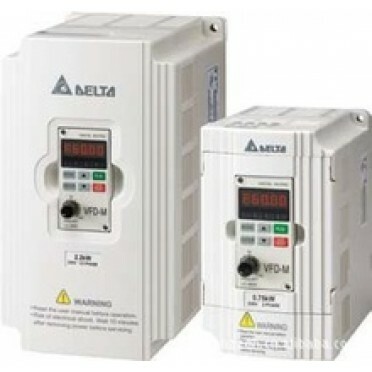 Specifically designed for low horsepower applications wi..
FeaturesThe VFD-EL series is multiple function new generation micro type AC drive. It has built in E..
D720 single phase inverter drives suitable for a wide range of drive applications from simple fan an..